Amazon Prime Member? Try Prime Music (is included in membership) and is awesome! If you are an Amazon Prime member - you know how great the 2 day shipping in. 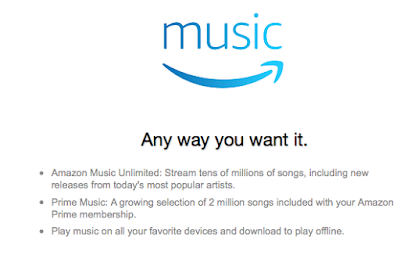 What many do not know is that Amazon Music is included in the membership. There are over 2 million songs available to you. As you can see below play music on all your favorite devices and even download them to play offline. If interested you can download the Amazon Music to your computer and upload your own music to the cloud. Apple Store - click here to download. Google Play - click here to download. 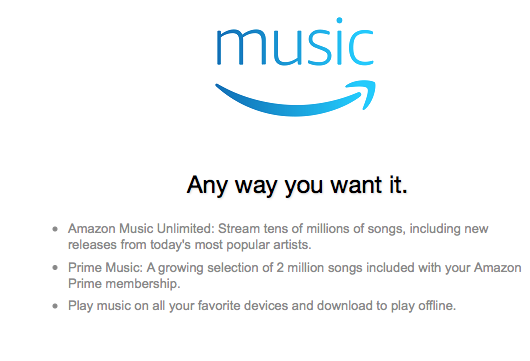 If interested - there is also Amazon Music unlimited that is $7.99 a month (over 10 million available songs).